Boogie boogie and a great BIG Happy Spring and Autumnal Equinox. For me it's a holiday. And like each new seasonal celebration, I make a three month goal and we exchange gifts. This is what Tim got me. And when I put it on my table, it doesn't move around or anything. I don't even need a wet paper towel underneath. And I got one for work, too. Am I spoiled or what? Those boards are great though but clean it in a dishwasher if allowed and use a bacterial spray between uses to get the best out of it. For very best results never cut uncooked meats on it. Ian: You don't have to be sorry. I love wood boards. They're great. 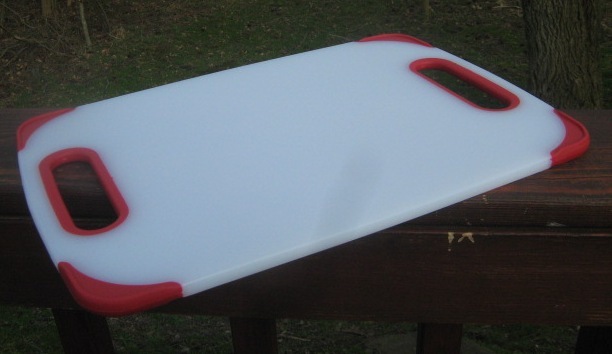 As for raw meat, I have a special board and cleaner, just for when I'm choppin' chickens. I remember these from my chef days, they're not bad, what did Tim get? Lurker: Game of Thrones on Blu-ray. But it's still not here yet. Ordered it from Amazon. Game of Thrones! I'd rather have that than a chopping board!!! Truly, I say thou art spoiled. Means preparing more tasty dishes for you! Pretty cutting board. I'm sure you'll get plenty of use out of it. i love this cutting board. i need one of yhis fot chivken. Ragnardbard: I'm big into celebrating. Alex: That's right. Fun, fun. Stacy: For us, yes. But for some of my buddies out there in Blogger Land, it's their fall equinox. Like Niki, who is excited about autumn. Gloria: Thank you. Have a wonderful day. For me having a cutting board that stays put is more important than the germ side of things. Do the corners bits keep that one in place? I picked up a wooden one with rubber feet years ago (rechecking now it's called "Gripperwood" -- evocative if not entirely pleasant). The down side (as it were) is that it's only one-sided. Spawn: Yeah the corner bits work nice. And the board we had a work was HUGE. This one is much easier for me to get to the dish room or our prep sink. I like the idea of wood with grippers. I'll have to Google that one. Congrats on fishing your work for school. That is VERY cool. Nice cutting board. I have three cutting boards: one for meat, two for veggies. There's nothing like chopping to make you feel like a real cook. Though in my case, it doesn't happen often. I'm so glad it's here. What a great idea, the giving of gifts to celebrate it too. I'm going to have to talk to the Hubby about this. Kathi: Not a big cooker? Cutting boards are fun. I have several for different jobs, as well. Anne: It's a great deal of fun. Carol: A stone one? Very nice. I saw a largeish stone one when I was at the gadget store. It's a true cook and lover of all things food who can get excited over a cutting board. Boogie boogie indeed. I meant to go on an Equinox walk - missed it. Time flies. Karen: Love those kitchen toys. Also, I clicked on your blog last night and it read, removed. I don't have your email and I haven't checked this morning. Headed to work now. Hope your blog is back up. Kim: It's good to be spoiled. And I love your new avatar. mshatch: It works great on the job as well. So fun. William: That is so cool. Thanks for telling me about it. I looked to see if I had your email to send you a thanks, but no go. Anyway, I love the sneakers. I love those guys! I've one for chicken (then another for all the other meaty things) and one for the veg. The non-slide rubbery thingies on the edges just make everything easier..and I'm not worried about what's oozing into the towel underneath. Toby: At work our board is huge and moves, unless I use a towel under it. This one does much better at work. But is still small for the amount of veg we prep. At home though, I love this little guy even more. So easy. Doesn't move. Just works great. Thanks for dropping by and cheers.